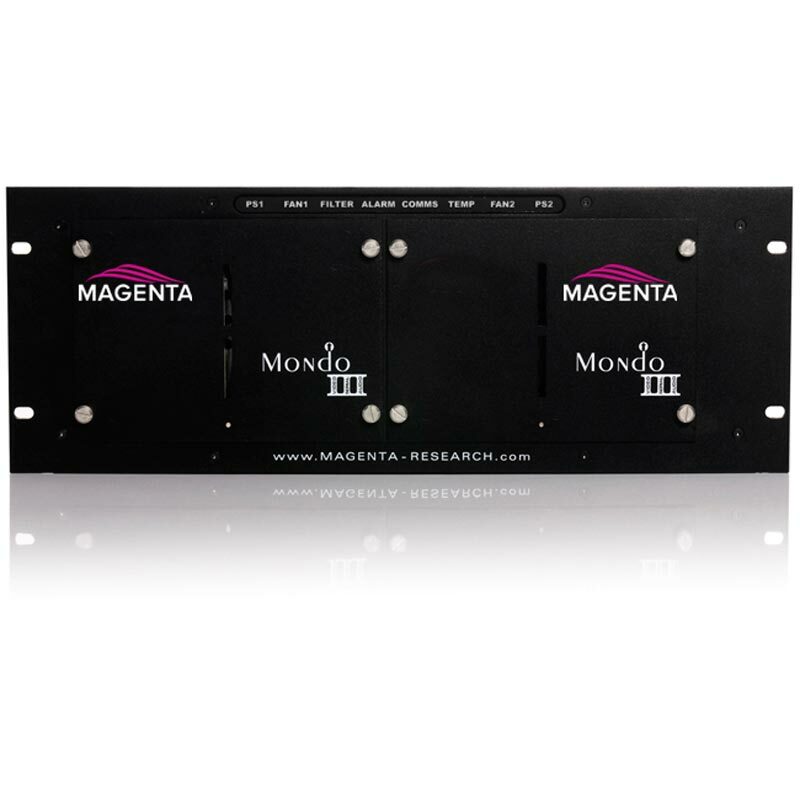 Magenta's Mondo Matrix III redefines the standard for UTP switching and extension by adding optional addressable duplex capability and a variety of redundancy and performance improvements. The new addressable duplex serial capability enables digital signage applications to collect individual display data and metrics in addition to independent control over each display. Like its predecessor, the field upgradable Mondo III also future proofs your investment by allowing for the addition of inputs and outputs in increments of 16, and supports an unprecedented maximum configuration of 256x512. Compatibility with all MultiView products enables the extension of 1920x1200 video, stereo audio and serial signals over a range of 1200 feet. 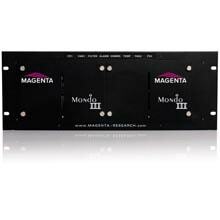 The Mondo Matrix III can be programmed and controlled using the onboard touch-screen, Windows HyperTerminal, Magenta's Mondo Matrix Control Software, or 3rd party control systems such as AMX or Crestron. The Mondo III also supports the option to integrate video inputs directly into a switch. The Mondo Direct option eliminates the need for separate MultiView transmitters. The Mondo Matrix III, while fully compatible with the previous Mondo Matrix, offers a host of upgrades, plus additional features and benefits at no additional cost. Mondo III now includes front-panel indicator lights, allowing switch operators to check status on the unit's power supplies, fans, filter and temperature at a glance. Mondo III also adds a replaceable air filter, two DB9 serial connections, true redundant power supplies and a new backlit 2x16 character LCD to aid in configuration and diagnostics.